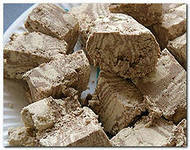 Halva is the most popular oriental sweet, it is wide-spread in countries of the Middle East and the Balkans. In Arabic, halva means "sweetness". Originally this gorgeous dessert were prepared in Iran, in the 5th century BC. Cook, who prepares halva is called kandalatchi. Usually the basic ingredients of halva are sugar (or honey), licorice root, also walnuts, sunflower seeds, almonds, sesame seeds, peanuts, etc. There are some kinds of halva: tahini halva, halva with oil seeds and nuts, sunflower halva, halva with cotton candy, halva made of flour, halva made of vegetables and milk, peanut halva, etc. Usually halva is cooked manually. Sunflower halva is very popular in Eastern Europe. Its basic ingredients are grinded sunflower seeds. Nut halva is prepared from different types of nuts: walnuts, peanuts, cashews, almonds and pistachios. Tahini (sesame) halva is cooked from ground sesame seeds. Peanut halva is cooked from crushed peanuts. Sometimes there are also other ingredients in halva: cocoa powder, vanilla, pistachio, chocolate. After careful preparation of halva is a dainty with walnut mass, it crunches and melts quickly in the mouth.